It's above a mall so the location is definitely convenient. As for the breakfast, it wasn't included in my stay so had no way to try. I waited over 3 hours to get my room because I arrived early and the staff didn't do anything about it. Of course, they could have suggested that I go to the coffee shop but nothing in terms of service. The price was expensive compared to other hotel apartments. It was clean and the staff were awesome. Also I loved that I could cook and it was very convenient to buy anything at all. The room is a full-blown appartment, so plenty of space. The staff is also very helpful. It is next to a shopping mall so at least you don't have to worry about food choices. The view over downtown was great. Bed was large and comfortable too. Spacious room, helpful staff. Breakfast very good. Loved the big apartment rooms and spacious bathroom and living room area. Great to have a washer and dryer inside the hotel room! Staff was kind. Large beautiful glass vases in the rooms. Hope this is not the case for guests with children! 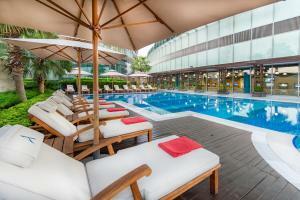 Lock in a great price for Burjuman Arjaan by Rotana - Dubai – rated 8.6 by recent guests! Burjuman Arjaan by Rotana - Dubai This rating is a reflection of how the property compares to the industry standard when it comes to price, facilities and services available. It's based on a self-evaluation by the property. Use this rating to help choose your stay! 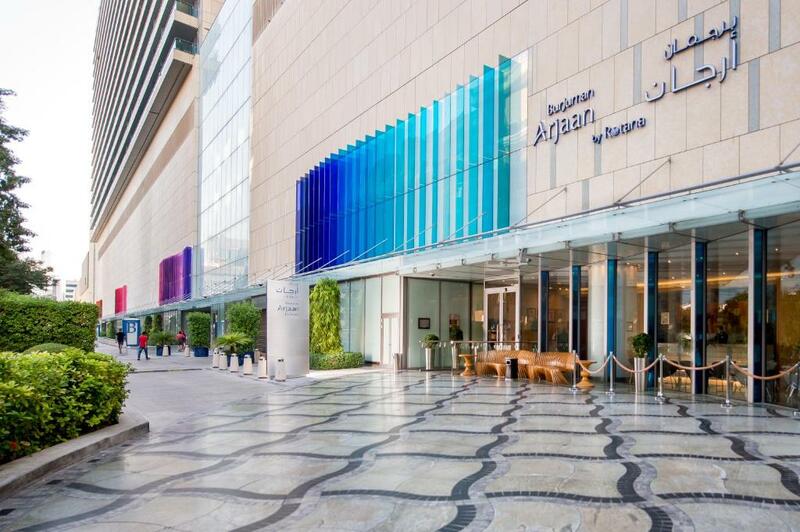 One of our top picks in Dubai.BurJuman Arjaan by Rotana Dubai invites guests to enjoy an exclusive level of design, luxury, style and cuisine for both leisure and business travelers alike. Set amid the vibrant and historical district of Bur Dubai and surrounded by rich culture and heritage, the renowned apartment hotel is part of a multifunctional complex that includes a shopping mall and an upscale office tower. Located just a few steps from the metro station giving you easy access to all major tourist attractions and business districts, everything is designed for your comfort and enjoyment. 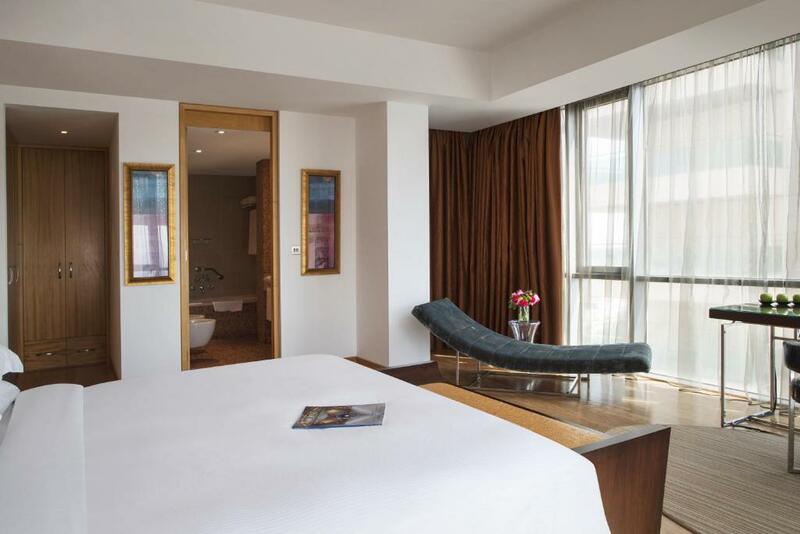 BurJuman Arjaan by Rotana, Dubai offers an impressive experience in every one of its 148 spacious suites. All of our accommodations has been designed and furnished with the most discerning guest in mind to ensure a memorable experience. 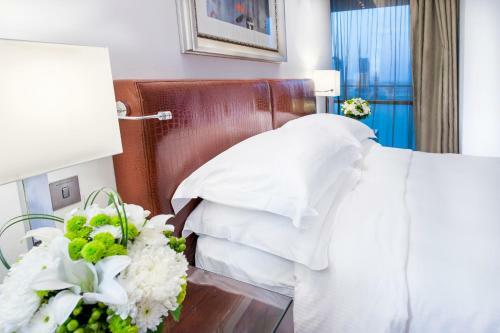 Warm, modern and well-lit, all suites feature a separate sofa lounge, kitchenette and dining area while guests can take in panoramic views of the enigmatic city of old and new Dubai as well as the bustling Dubai Creek. To ensure a complete experience while visiting BurJuman Arjaan by Rotana, guests can enjoy a number of its 5-star facilities. Guests can keep fit while visiting us at our full equipped gym, relax and unwind at our child-friendly outdoor swimming or just savor in a selection of culinary delights in the all-day-dining restaurant, The Gallery. 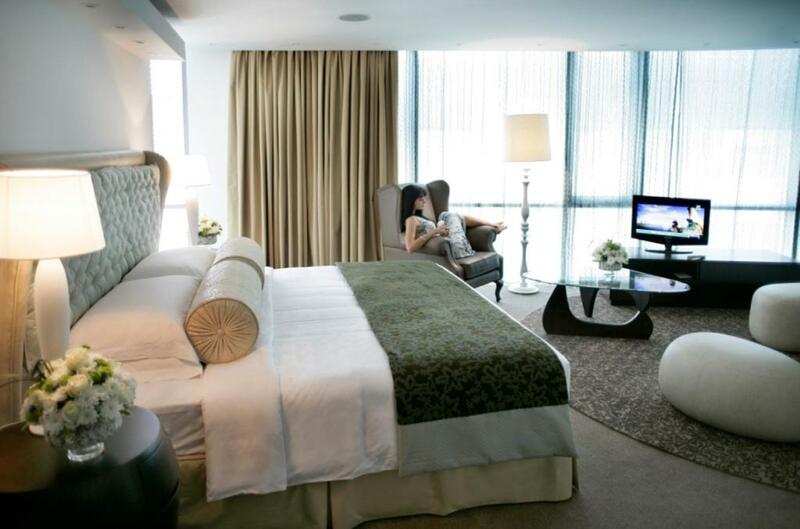 When would you like to stay at Burjuman Arjaan by Rotana - Dubai? All Classic Suites are 70sqm in size and are uniquely designed as a one bedroom apartment. Each suite has a king size bed, a separate living and dining area while boasting a fully equipped closed cabinet kitchenette. Stunning views overlooking Bur Dubai or the Arabian Sea shoreline pool view can be enjoyed from the suite. The spacious one bedroom Deluxe King Suite consists of a unique combination of comfort and functionality. 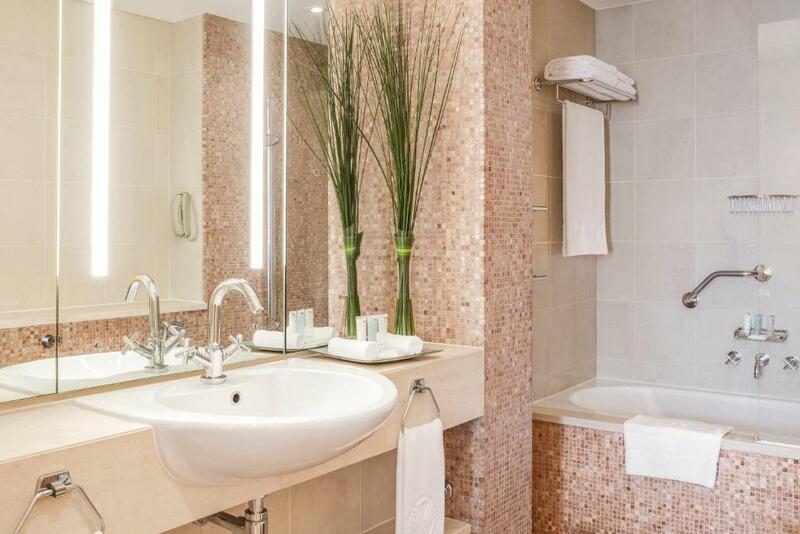 An impressive 109sqm, the suite is ideal for short and long-term guests. With an open plan kitchen, separate living and dining area the suite offers all the modern amenities you could need. 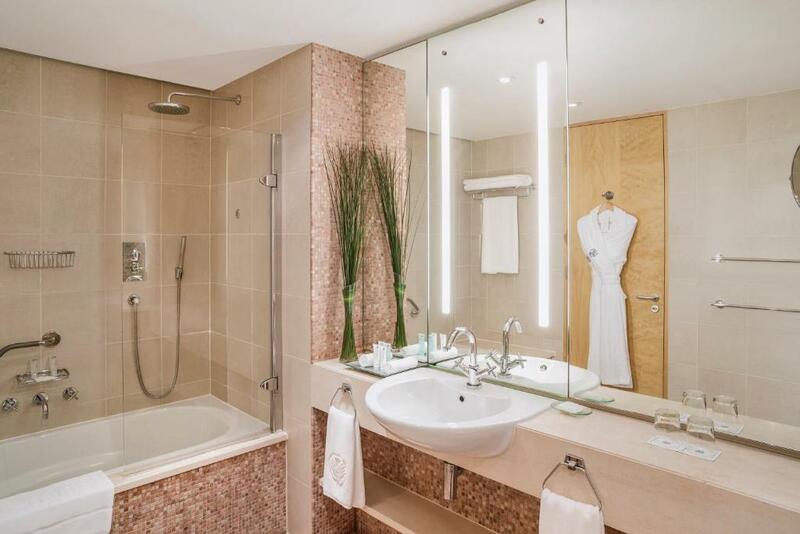 This contemporary one bedroom suite is furnished with elegant and modern interiors, providing guests with all the comforts of home coupled with sleek five-star services. The spacious 144sqm one bedroom apartment has a fully open furnished kitchen, separate living and dining areas while boasting stunning panoramic views can be enjoyed from the large wraparound balcony. 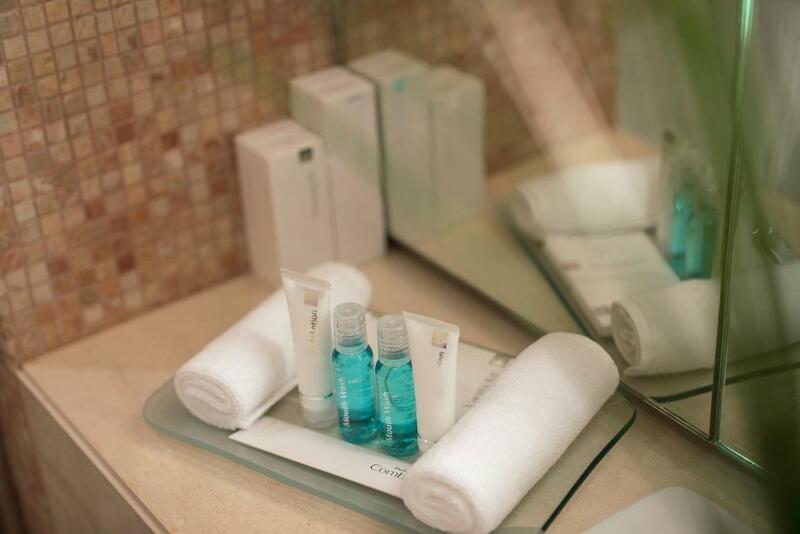 Relax in pure comfort in a one bedroom Deluxe Twin Suite. Measuring 99sqm each suite has queen twin beds adjacent to a comfortable living room and including a fully equipped open kitchenette with state of the art amenities. With impressive panoramic Dubai city views the luxurious Townhouse features a double-story 3 bedroom apartment making up a spacious size of 370sqm. It comfortably sleeps 6 with 3 modern bedrooms each with an private bathroom, separate fully furnished kitchen, living and dining area offering all the comforts and modern amenities to make one feel at home. Located high above the city on the hotel’s 23rd & 24th floor, the duplex 4 Bedroom Penthouse is a one of a kind in the area. Featuring breathtaking views, 4 elegant bedrooms with 3 king size beds and 1 twin bed and spacious living and kitchen areas makes it ideal for business or leisure. This very spacious, modern suite features a balcony with panoramic views of Dubai. It includes an open-plan kitchen with a refrigerator, a hot plate, a microwave and a dishwasher. It also has a king size bed, a separate living room with a flat-screen satellite TV, a DVD player, an iPod docking station and a marble mosaic bathroom. This air-conditioned suite includes a one-bedroom Classic Suite, Deluxe Twin Suite and a Deluxe King Suite all connected through one main door. Each suite contains a living room, kitchenette and dining area with modern finishing's and fittings to ensure a comfortable and relaxing stay with friends and family. At BurJuman Arjaan by Rotana, we promise a Treasured Time to all and we look forward to welcoming you like family. Each of our colleagues are professionally trained and passionate about what they do. Right from the start we are dedicated in making your stay as comfortable and personal as possible. Anything you may require the colleagues at BurJuman Arjaan will be able to assist you as our goal is to focus on making you feel at home. BurJuman Arjaan by Rotana is set amid the vibrant and historical district of Bur Dubai and surrounded by rich culture and heritage. The renowned apartment hotel is part of a multifunctional complex that includes a shopping mall and an upscale office tower. Located just a few steps from the metro station giving you easy access to all major tourist attractions and business districts, everything is designed for your comfort and enjoyment. House Rules Burjuman Arjaan by Rotana - Dubai takes special requests – add in the next step! Burjuman Arjaan by Rotana - Dubai accepts these cards and reserves the right to temporarily hold an amount prior to arrival. Please present the credit card used to make this reservation upon check-in at the hotel. If you are booking on someone else’s behalf, please contact the hotel directly to arrange for third party billing. Debit cards can only be used upon arrival at the property. Please note that holding parties & gatherings are not allowed in any suite. Please note that if the room is booked on a flexible rate, in case of no-show 1 night will be charged. In case if the room is booked on a nonrefundable rate, no-show will be charged for full stay. Please inform Burjuman Arjaan by Rotana - Dubai of your expected arrival time in advance. You can use the Special Requests box when booking, or contact the property directly using the contact details in your confirmation. Julie at the reception was very welcoming and listened to my request and made sure to provide. That was very heartening. Room were very spacious, well lit and clean. Bed was good and food ordered was awesome. Overall great stay. The light switches were a little confusing, the side balcony was a bit scary overhanging in the wind, and the view from the main balcony was blocked slightly by overhead metal signage. The suite was a little dated, but considering the reasonable price paid, the views, location, and large rooms and space, overall the minus points were heavily outweighed by the positives. Upgraded to the panoramic suite on the 23rd floor for a discounted rate on arrival and so pleased with this. The place was huge and the views were fantastic. It was a real home from home. We got exactly what our research suggested and that is a perfect location to stay. Prices realistic because it isn't close to the main attractions, but the location was fantastic due to having a shopping mall, food court and metro station all attached. So we could easily bring food back to the suite, or if tired after a day sightseeing we could grab some food in the food court on the way back in, plus with the metro we could get to most places very quickly. Taxis were cheap and the staff were very helpful getting these for us when required. A really enjoyable and memorable stay. If we return to Dubai again in years to come then we will stay here again. I booked a suite, it was advertised with cleaning products. I expected a small dish washing liquid as in other hotels / apartments i have stayed in. There was none supplied. I also think there should be a tea towel supplied to dry the dishes. Location great, easy access to the mall and metro. Breakfast needs to be refreshed every 2 days - seeing the same choices for the week gets a little tiring. This hotel is a 'must stay ' for anyone traveling to Dubai for the first time. It is excellently located for local leisure activities such as; local souks, the Burjamaan Malls and other local shops and amenities. The front of house staff are absolutely first class, courteous , professional willing to help you at all times. Local taxi service that liaise with the hotel , professional value for many. I hope to revisit Dubai in the near future and would not hesitate to rebook there.